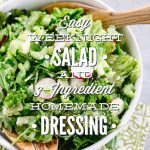 Today’s Easy Weeknight Salad and 3-Ingredient Homemade Dressing is a recipe that would make Julia proud. Family-friendly? Check. Check. Check. Check. Real food doesn’t have to be complicated or fancy. Real food is in fact so delicious on its own, thanks to the quality of ingredients and “realness” of the food, that recipes don’t need to be complicated or fussy to be utterly delicious and AMAZING! I know many people, maybe even you, are scouring the internet right now after setting a healthy food goal, looking for tasty recipes. 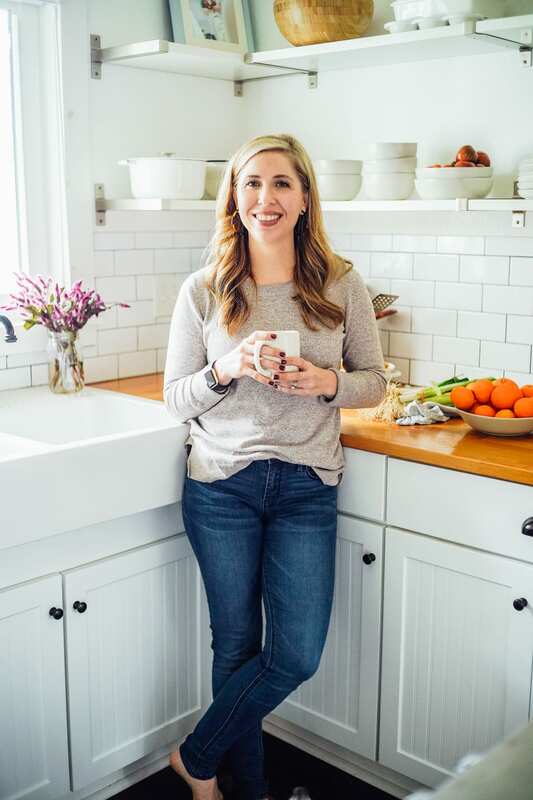 And by now, you (a hypothetical “you”) may feel a tad bit overwhelmed by the number of complicated healthy recipes available on Pinterest, Google, and every social media channel out there. Now, I’m all for variety and trying out new recipes, but sometimes the idea of cooking new meals that require multiple steps and ingredients every single night can be tiring. Or maybe that’s just me? 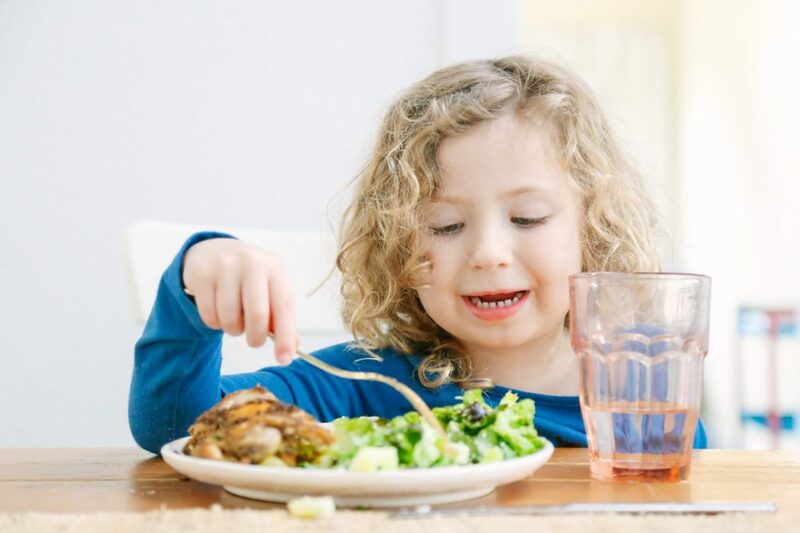 Friend, if you’re at that point, let’s sit down to an uncomplicated salad and enjoy the simplicity of real food. 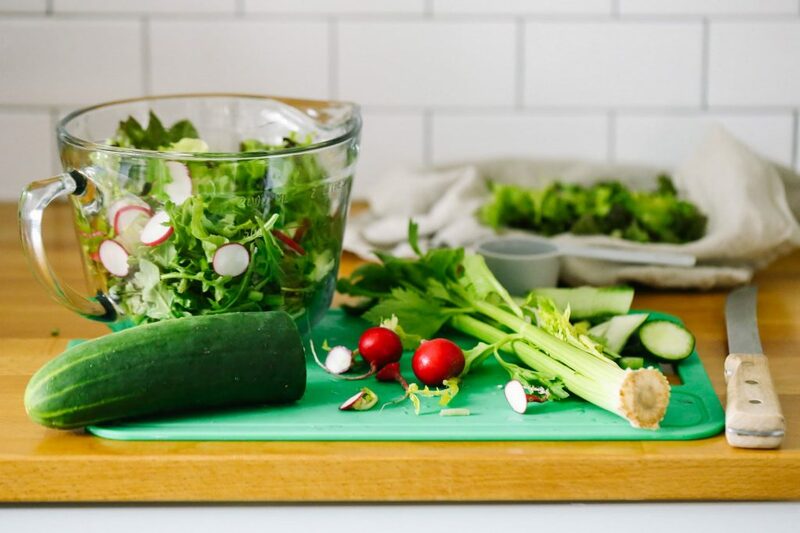 My Easy Weeknight Salad and 3-Ingredient Homemade Dressing isn’t the most innovative recipe ever created, but it’s packed full of simple ingredients that tantalize the tastebuds and deliver fresh nutrients in every bite. And aren’t those two things, nutrition and taste, the very characteristics that separate real food from boring processed food? 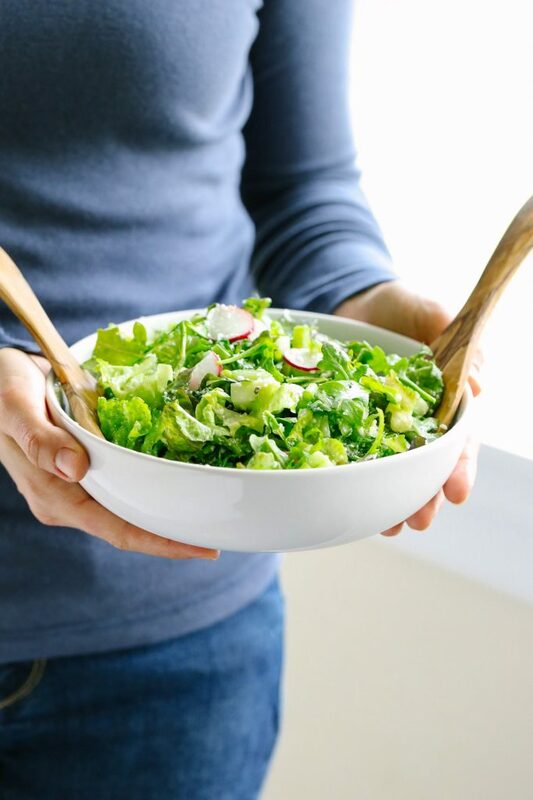 Thanks to the simplicity and pleasing flavors of this simple salad, this recipe is regularly served at our dinner table (and sometimes for lunch, too). Sometimes this salad accompanies crispy herb-roasted chicken thighs (I’ll be sharing this recipe soon), quesadillas, a grilled steak with a simple salt and pepper seasoning, a simple homemade soup, or pasta with a meat or veggie spaghetti sauce. 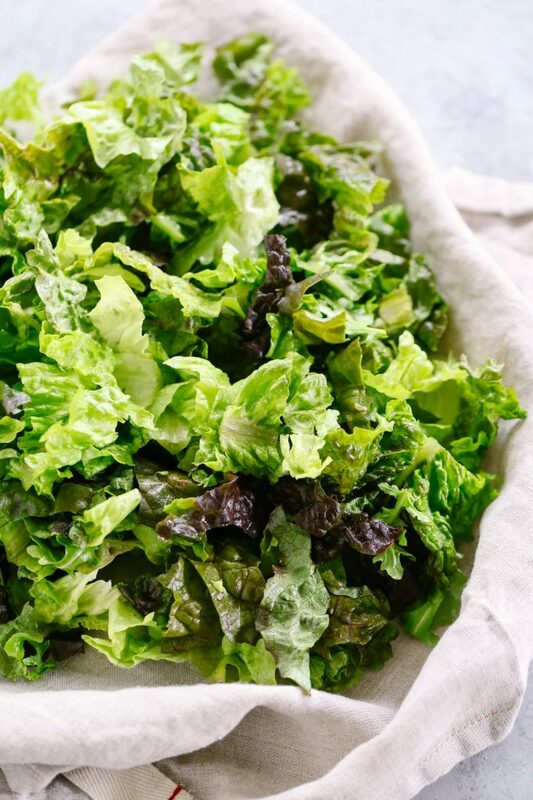 This salad is super versatile, which makes it a very affordable side dish or even main meal (when served with a protein, like shrimp, sliced meat, or shredded chicken and homemade bread). 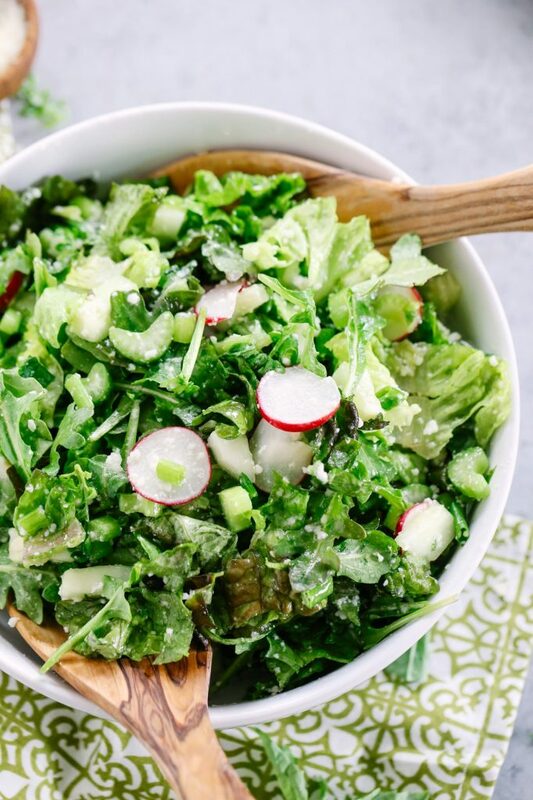 While my favorite veggies to use in this salad are radishes, green onions, celery, and cucumbers, many other seasonally-appropriate veggies may be used. Sometimes this means adding sliced cherry tomatoes instead of cucumbers, or subbing parsnips for the radishes. If you plan to sub veggies in this salad, think about adding a mixture of crunchy and soft veggies. 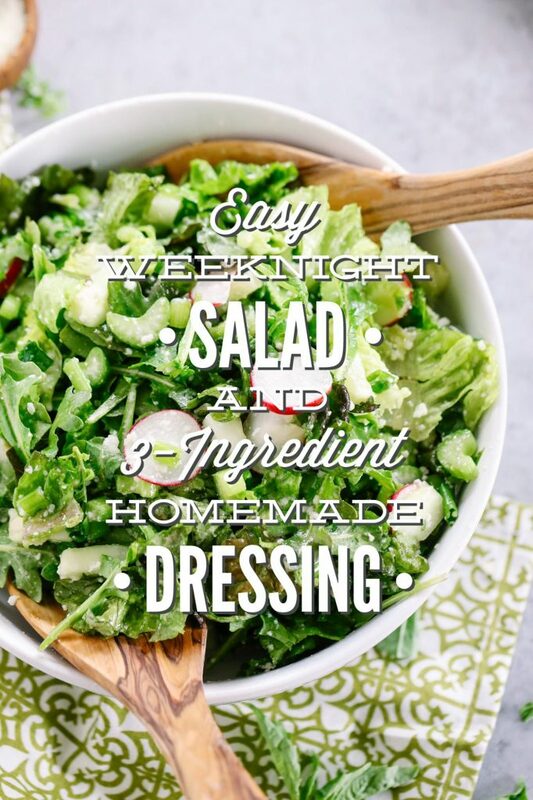 My Easy Weeknight Salad and 3-Ingredient Homemade Dressing isn’t the most innovative recipe ever created, but it’s packed full of simple ingredients that tantalize the tastebuds and deliver fresh nutrients in every bite. 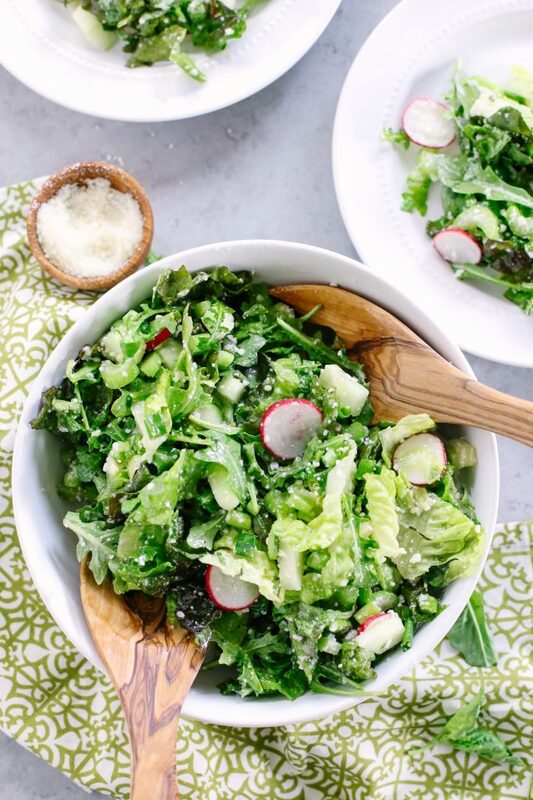 In a large bowl, combine the lettuce, arugula, chopped/sliced veggies, parmesan cheese, and basil leaves. 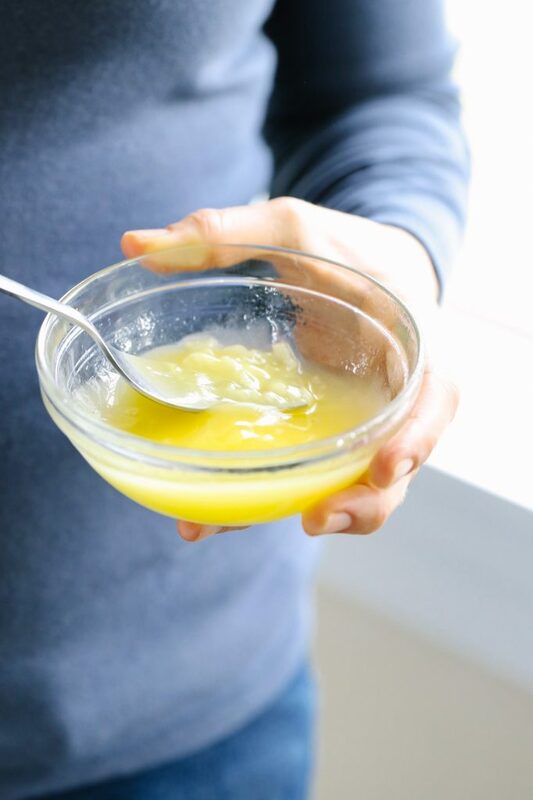 In a small bowl, whisk together the olive oil, lemon juice, minced garlic, and salt. The salad dressing will appear "cloudy" when it's ready (about 20 seconds of whisking). Pour the dressing over the salad. Serve as a side. Add chicken, shrimp, or steak for a main course salad. *The flavor of your salad dressing will depend on the size of your garlic clove. I love a super garlicky salad, so I tend to choose a large garlic clove. If you’re not a big garlic fan, try a smaller clove. Want to experiment with a different flavor? Try adding a few squirts of dijon mustard to the dressing, then whisk the ingredients. I finally made this after thinking it looked like a great idea for at least a year! I did add a squirt of Dijon and probably a teasooon of honey to mine and it was great. Instead of smothering your salad with dressing this seemed to enhance the taste of the greens. And it brings a nice touch of spring to your table. Hey Kris, I’m so glad you enjoyed it! Thanks for sharing!